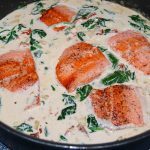 Pan-seared salmon fillets in a creamy white wine sauce with sun dried tomatoes, onion, garlic, baby spinach and Parmesan cheese! Heat the oil in a large skillet over medium-high heat. Season the salmon fillets on both sides with salt and pepper, and sear in the hot pan, flesh-side down first, for 5 minutes on each side. Once cooked, remove from the pan and set aside. Melt the butter in the remaining juices left in the pan. Add in the garlic and onion, sauté until the onion is tender. Pour in the white wine or chicken broth and allow to reduce down slightly. Add the sun dried tomatoes and cook for 1-2 minutes to release their flavor. Reduce the heat to low, add the half and half. Bring to a gentle simmer, while stirring occasionally; season with salt and pepper to taste. 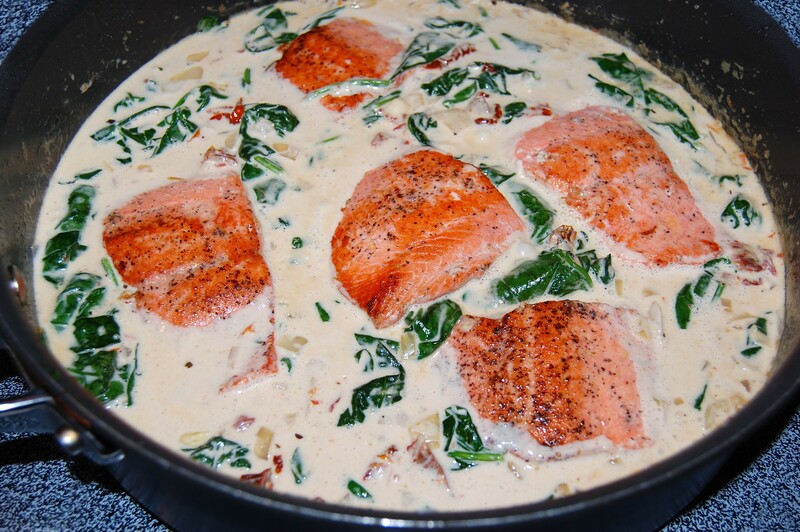 Add the salmon back into the pan; spoon the sauce over each fillet and garnish with fresh chopped parsley. Serve over rice, pasta, or steamed vegetables.